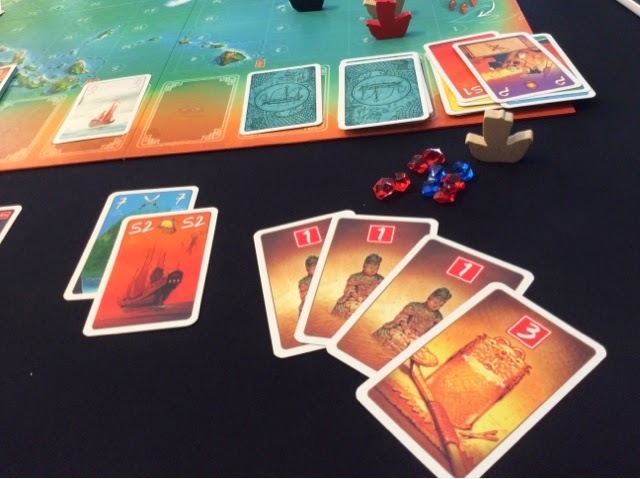 Sail to India is a small box euro game of efficiency and resource management. Players have cubes that are multi use whereby they could be ships, resources, buildings, or markers for VPs and money. 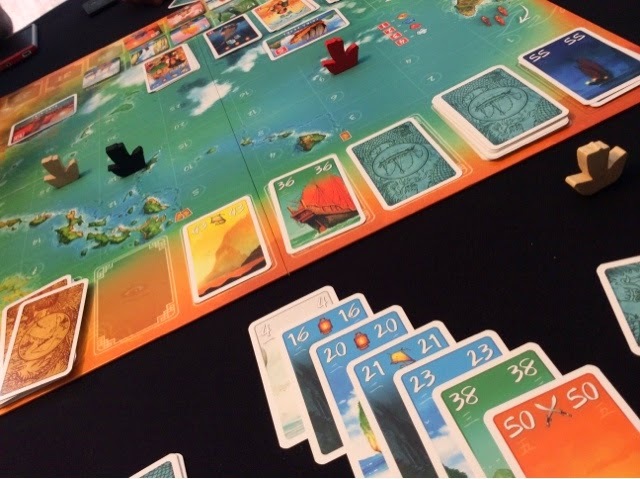 Each turn players have 2 actions to sail, sell resources, build buildings, research technology, or hire more cubes. The main trick of the game is for players to smartly manage their use of their available cubes. Often times you will find that you have insufficient cubes to not only execute actions, but to use to lock in the VPs and money you obtained from those actions. I've discovered India! Do I win? Well, the game went by at quite a snail's pace as we kept getting resources, selling them, and thus ended up far from India (the final card). We also didn't hire all our cubes so the game ending conditions were not met. Eventually I decided to race to India since that was what the game was about. Haha. So I powered my way to the finish as fast as I could. The final scores were 17-16-14. Me with 16! :( And I was very certain I would win! Haha. The winner loaded up on churches and bought the mission church technology and that was sufficient to beat out my gradual collection of VPs. I'm not sure what to make of Sail to India. The actions didn't seem very exciting and I must say I wasn't completely engaged throughout the whole game. I only bought 1 technology and that was the free one that gave me a discount on future technologies. But the technologies were just not that interesting enough for me that I wasn't at all tempted to buy another one. I considered, but just wasn't sure how much they would affect my game. As it turns out, the technologies were pretty crucial, at least for the case of the winner. I would like to give it another go soon, maybe with Eric to see what he thinks about it as well. For now I'm kinda lukewarm on it. I was hoping to have more interesting choices for my actions besides claiming goods, buildings or technologies. Sometimes you can't do one or the other due to the lack of funds, so the choice becomes rather obvious, take goods and make a small quick sale or wait for a big one. The sailing was hardly interesting as well since there are only 3 possible buildings and the chance of revealing a good that you don't have yet is high as it's hard to accumulate 5 or 6 different types of goods. So the sense of wonder in exploration was lost. You would only do so for the point it gives (and 2 for reaching India). I suppose the exciting part was supposed to be the cube management, but I'm not sure that that was that exciting for me. So yeah, a rather bland first impression for me. Next up was Fairy Tale. I had played fairy tale before - many years back - and remembered enjoying it, so I put it together with my shipment for Sail to India. Now it was time to see if it stood the test of time and whether my friends would give it a thumbs up. Fairy Tale is a pure darfting set collection game. 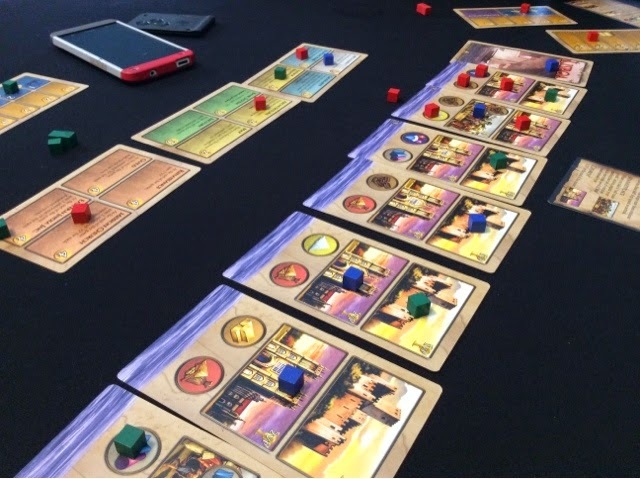 Each game is played over 4 rounds, and during each round players start with 5 cards whereby they will choose 1, and pass the remainder around and continue to do this till they each end up with 5 cards again. From these 5 cards, players will play 3 and throw 2 out of the game. So when the game is over, each player will have 12 cards in front of them, after which points will be tallied and the person with the most points is the winner. Plain and simple! When the cards are revealed, some of them have special abilities which affect either the player or everyone else. These abilities mainly force the target to flip or unflip cards, this leads to the players having face down cards that don't count at the end of the game. Cards without abilities will have points that vary or are conditional based on how many other cards of certain types you have in your tableau. We played two games and nearly went for a third but changed our minds to carry on win something else. I think it has aged slightly, it's still fun but feels a bit basic. My friends loved it though. It was quick (20 mins) and yet still had a pretty decent game in there. They weren't too in tune with blocking during the first game which led to a runaway winner, the second game was much closer. However, I have some complaints about the new card in the zman version - egg of chaos. It seems too overpowered for my liking. Having an almighty ability, plus 2 points, plus counting for 3 other types of scoring conditions made sure that whoever had the card was the winner of the game. In the first game, the only player who had it won, in the second game I won having 2 copies of it and the second place player had 1 copy of it. The loser had none and was further back. I might remove it from the game on future plays. Not entirely convinced that it is a balanced card. I took a chance and imported Madame Ching - although it came without English rules (breaking a game purchase rule of mine) - because I loved the look of it and it sounded like a game I would enjoy (also cos I was totally down in the dumps. Haha). Being designed by the duo of Bruno Cathala and Ludovic Maublanc made the decision easier as well. 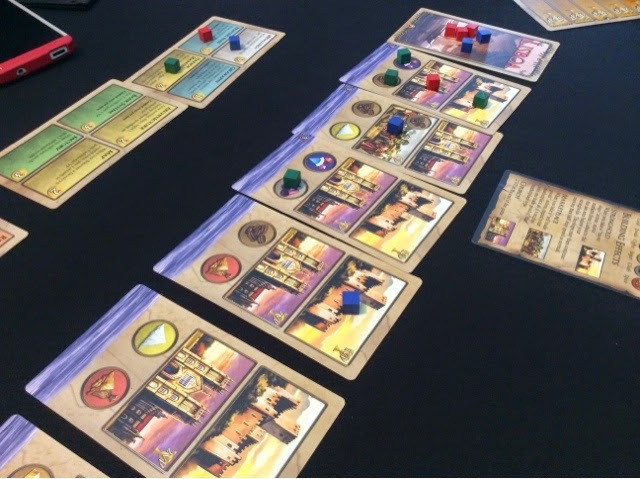 In Madame Ching, players are trying to collect the most points either by completing missions, or by gaining multiple skills and encounter cards. 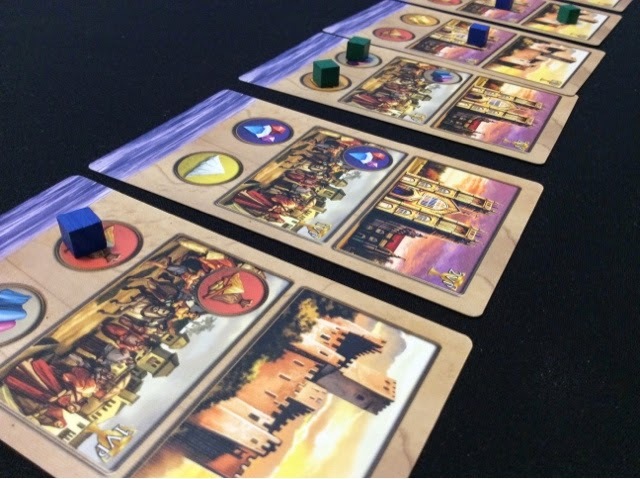 On a player's turn, he/she has to play a navigation card to further their expedition; after which the player may choose to play an encounter card or not, and then draw a new card from a line of face up cards (and one face down card). This happens turn after turn till 1 of the 2 end game conditions are met. The main focus in the game is your expedition management. To further your expedition, you have to play a navigation card of a higher number than the last card played. This is sufficient to move your junk forward. However, the best result is to move your junk forward and down (diagonally), this is done by not only playing a card of a higher number, but also a card of a different color than those already played. This is more difficult than it sounds as players only have 4 cards in hand and getting the right colors and numbers is difficult as to get the first choice of the reveal cards, you have to play a high number to go first - this means that your expedition is ending on a high number which also makes furthering it in the future much harder. So a good balance and timing is required. I won quite comfortably. Think my friends got the game a little too late. If you successfully further your expedition, then you can improve it more next turn, if you don't however, then you will check to see if you have gone far enough to complete a mission. Missions give you jewels that count as points at the end of the game. If you can't co plate a mission, you get an encounter card instead. Also, when you end your expedition (and immediately start a new one), you will check of your previous expedition cards have enough symbols to learn a new skill. 3 of the same is sufficient to earn 1 of 4 different types of skills. These skills give you a one time ability that is supremely valuable. If you can earn all 4 different skills, you can a bonus of 5 points and the game ends immediately. Overall, I really really enjoyed my play of Madame Ching. It's quick, simple and yet very engaging. The choices are not many, but putting yourself into the right situation for success is not easy. You won't always have a successful expedition due to the lack of missions; so you have to plan in advance and try to aim for something that no one is really gunning for. Being last is a disadvantage but sometimes you eat it cos it aids in your expedition card management. The skills and encounter cards also shake things up in the game a bit. You may alter your expedition movement just to gain a skill for future use. Also, the way to get new encounter cards is by having a somewhat less favorable expedition, so you may set aside a small quick expedition to gain a card or two for further situations that call for it. We all enjoyed it and I think it's one that will likely see table time again. I do wish it played more than 4 players so that I can introduce it to my other groups, but I'm liking what I have seen thus far and I think it might be a keeper for now. Replayability may be an issue with limited missions and similar gameplay game to game, but I'll reserve that judgement till I get in more plays. Well, we then went on to one of our all time favorites - Horse Fever! But since this post is rather long, I'll get that in in a separate post some other time! We also got in a few more games of Trieste, but erm, yeah, I was supposed to post about that sometime back yeah? Haha. Ok, soon! Sushi Go or Fairy Tale? 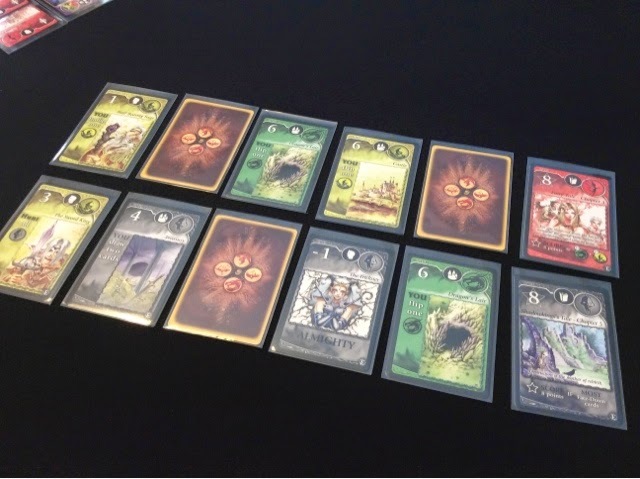 2) fairy tale plays throughout the whole game rather than individual rounds like in sushi go. In sushi go, if you have a terrible round, you likely can't come back from it.